Note: This report has an added a feature that lets you easily see associated documents. When the text refers to an event (e.g., a death) for which an associated document is available, a link will be provided to that document. If you see a word or words in bold text and underlined, just click on it. For example, in the third paragraph below you will see "He died in Terlingua". Click on "died" to see the death record. To return to the main report, simply click the back arrow (usually in the upper left of your computer screen). Preciliano Chacon was born in Sierra Gordo, Durango, Mexico circa 1872, the son of Olejo Chacon and Juana Nunez. He married Cenobia Gonzalez circa 1899 in a civil ceremony. She was the daughter of Aniceto Gonzalez and Concepcion Martinez and was baptized in Fresnillo, Zacatecas, Mexico November 7, 1880. The couple lived in Sierra Mojada, Coahuila, Mexico before immigrating to the United States in 1913. By 1920 they were living in the Terlingua area, where Preciliano was working as a mine laborer, probably with Chisos Mining Company. In October 1926 he was injured by falling rock while working at the 650-foot level in the Chisos Mine. He missed work for two days as a result. On April 4, 1920 Preciliano and Cenobia renewed their wedding vows in a church ceremony, very likely in St. Agnes Catholic Church in Terlingua. Father Antonio Alonso led the ceremony and the witnesses were Alberto Moreno and his sister Elvira Moreno, who also was their daughter-in-law. Preciliano continued working in the Terlingua mines until 1930. He died in Terlingua of pulmonary tuberculosis May 12, 1930 and is buried in the Terlingua Cemetery. Cenobia eventually accompanied son Jose to El Paso. She died of a stroke at her home in El Paso December 4, 1963 and is buried in the Evergreen Cemetery, El Paso. 1. Son Jose G. Chacon was born March 19, 1901 in Sierra Mojada, Coahuila. He immigrated to the United States in 1913 and, like his father, went to work for the Chisos Mining Company. He continued to work for that company at least until 1935, and probably until 1941. On September 20, 1919 he married Elvira Moreno in St. Agnes Catholic Church in Terlingua. 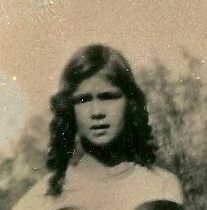 She was born August 9, 1904 in Lajitas, the daughter of Martin Moreno and Natividad Urias. They were married by Father Antonio Alonso and their witnesses were Jesus Perez and Pascual Munoz. a. Daughter Demetria “Demmy” Chacon was born in El Paso July 20, 1966.
b. Son Jose Chacon IV was born in El Paso January 25, 1970.
c. Son Samuel “Sammy” Chacon was born in El Paso April 3, 1971.
d. Daughter Rebecca Chacon was born in El Paso March 1, 1979. Vicky Orona Chacon died of liver cancer November 17, 1993. Jose later married Cleotilde Martinez. They had no children. (3) Twins, a son and a daughter, were born in Terlingua. They both died soon after birth. a. Daughter Betty Diaz was born in El Paso July 25, 1960. Her married name is Kilcrease. b. Son Abel Diaz, Jr. was born in El Paso October 24, 1962.
c. Son Paul Henry Diaz was born in El Paso May 10, 1964.
d. Son Joe Diaz was born in El Paso June 25, 1965.
e. Daughter Olga Diaz was born in El Paso July 19, 1968. Her married name is Deslongchamps. f. Son Davy Diaz was born in El Paso November 29, 1969.
g. Son Jerry Diaz was born in El Paso April 26, 1975.
a. Son Mark Anthony Chacon was born in El Paso November 15, 1963.
b. Son Roberto “Bobby” Chacon, Jr. was born in El Paso January 23, 1967.
c. Son Rocky Chacon was born in El Paso March 25, 1976.
d. Son Jovan Chacon was born in El Paso July 28, 1980. (6) Son Francisco Javier Chacon was born March 1, 1947 in El Paso and was still living there in January 2012. He never married and had no children. a. Daughter Yvette Arellano was born in El Paso September 9, 1967.
b. Son Alejandro “Alex” Arellano was born in El Paso December 8, 1968.
c. Son Xavier Arellano was born in El Paso April 5, 1970.
d. Son Cristobal Roman Arellano was born in El Paso November 25, 1973.
e. Son Baltazar Nicolas Arellano was born in El Paso October 24, 1979. (8) Daughter Blanca Margarita Chacon was born December 24. 1962 in El Paso and was still living there in January 2012. She married Felix Rivera, Jr. May 4, 1984. They have no children. C. Son Rodolfo Chacon was born in Terlingua March 25, 1925. He moved to El Paso around 1944 and lived there until his death. He worked as a bartender in a cocktail bar. He died of heart problems in R.E. Thompson General Hospital April 22, 1974 and is buried in Evergreen East Cemetery, El Paso. D. Son Felipe Chacon was born in Terlingua in May 1926. He died there August 2, 1926 and is buried in the Terlingua Cemetery. E. Daughter Maria de la Luz Chacon was born September 23, 1929. She suffered a head injury during birth and was taken to Alpine for medical treatment. However, she died there September 29, 1929 and is buried in Alpine. F. Daughter Ernestina Chacon was born July 23, 1935 in Terlingua. G. Son Alfredo Chacon was born November 11, 1939, probably in Terlingua. H. Son Eduardo Chacon, twin of Ernesto, was born in El Paso April 29, 1944. I. Son Ernesto Chacon, twin of Eduardo, was born in El Paso April 29, 1944. J. Son Mario Angel Chacon was born in El Paso October 4, 1947. Brewster and El Paso County death records. Marriage records from St. Agnes Catholic Church in Terlingua, copies available on microfilm from the Church of the Latter Day Saints. Family history information and photographs provided by Blanca Chacon Rivera. Brewster and El Paso County birth records. 1920 and 1930 Federal Census records for Brewster County.